This is a traditional Slavic dish that as old as the people. Like with other old recipes, there are quite a few varieties and ways of serving them, including the meat stuffed ones we’ve covered before. These come out very soft, fluffy, and savory. 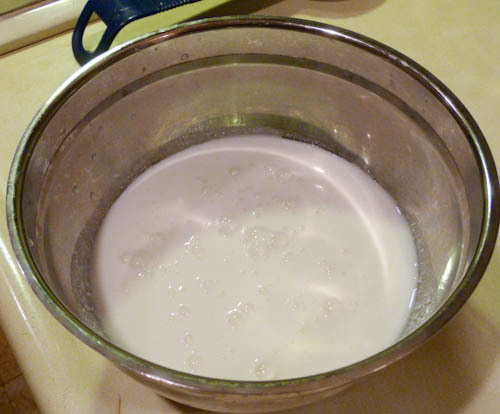 Pour the kefir in a pot or a stove-safe metal bowl, and put on the stove on medium heat. Heat it while whisking until it’s warm to the touch, don’t bring to a boil. 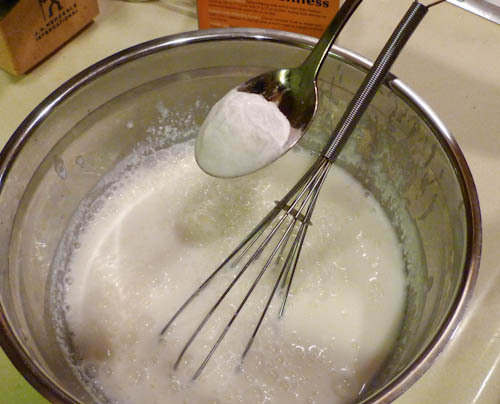 Add the baking soda and whisk vigorously, and let the mixture froth up. Add the sugar and salt. Begin to slowly whisk in the flour. 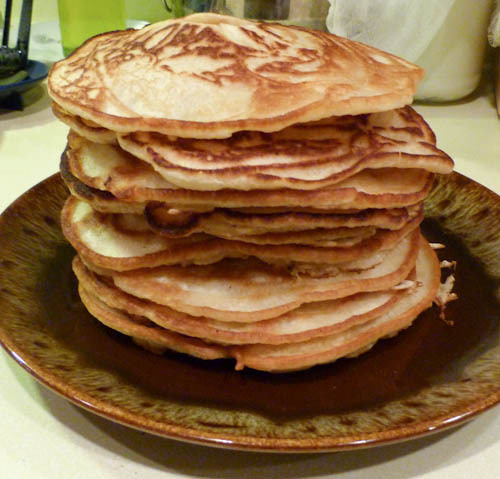 The consistency you’re looking for is that of pancake batter or slightly thinner. 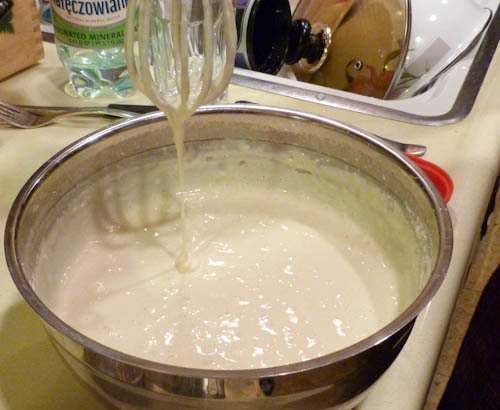 The batter should almost be falling off in chunks off of the whisk but mostly liquid. 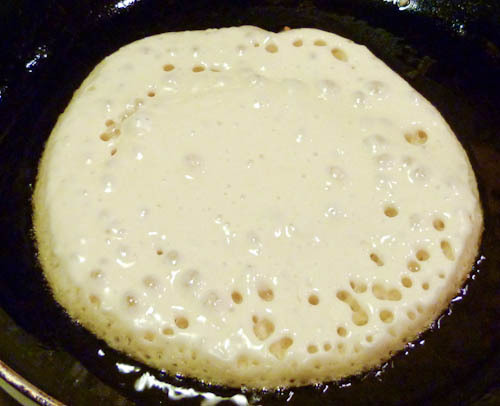 Add more flour if you want thicker blini. Heat a well oiled pan on medium heat. 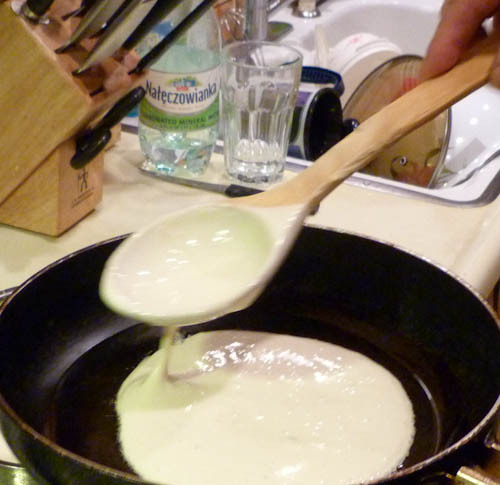 Use a large spoon or a ladle to pour the batter. 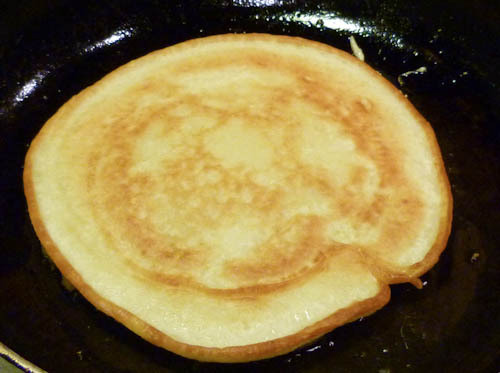 Let cook until you begin to see the edges of the pancake start to brown, this should take a minute or two, then flip. Serve warm with some sour cream and or jam. Posted in: appetizer, Dairy, Desert, Holiday, meat-less. 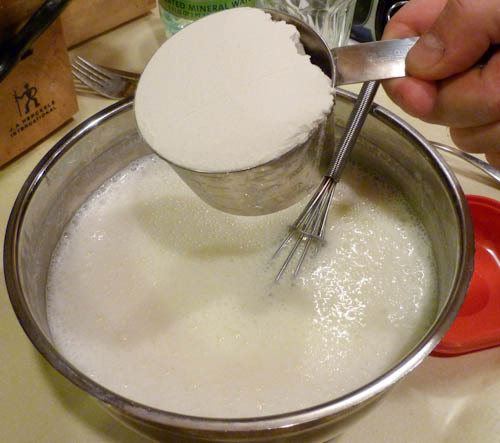 This is an interesting recipe – I have never come across this method of making bliny, with warmed kefir. thank you! they certainly remind me of my mum’s plump oladushki. Hi 🙂 I am from Poland and I was curious about Russian food. Your blog is perfect! Food is delicious and similar to Polish 🙂 I love it! Thank you so much for your recipes and your blog! The step by step pictures are great. All the best! Why do you need to heat up kefir? Also at what point do you stop heating. 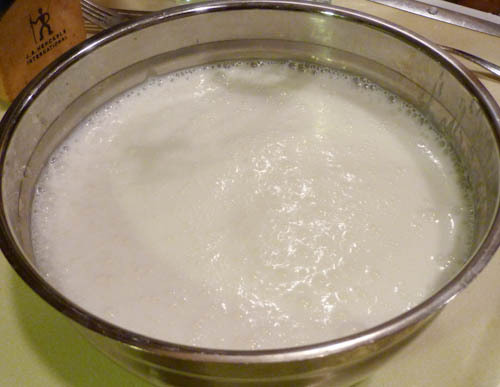 Do you heat the kefir and stop or continue heating while you add the other ingredients? You heat it up to make the reaction with baking soda more vigorous, you only heat it until it’s warm to the touch and then remove it from heat. Add all the ingredients after. My Mom made this before! It was really good, her friend Luda told her the recipe. 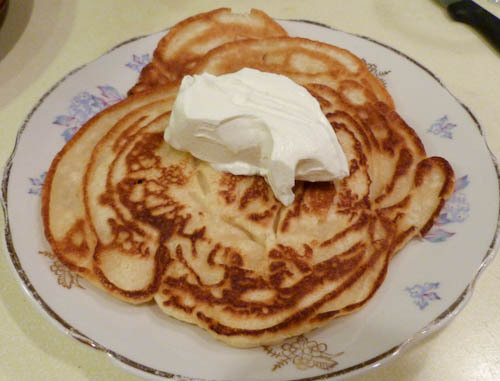 Traditionally blini do’t have any raising remedies, however, by looking at the ingredients the proper name for this dish is oladi.